I am officially obsessed with this vegan sweet potato smoothie. It’s ultra-thick and creamy and has the most amazing flavour. It tastes like sweet potato pie! You can drink it with a straw but even better, pour it into a bowl, top it with granola and eat it with a spoon. This smoothie is plant-based, high in protein and fibre and loaded with nutrition. I love adding vegetables to smoothies and sweet potatoes are one of my favourites. 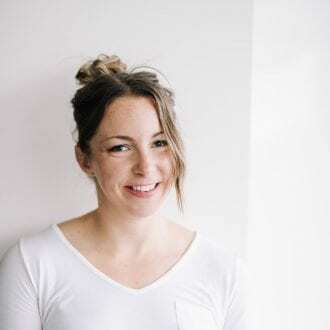 They add healthy complex carbs and substance without adding extra sugar, plus they’re loaded with antioxidants and other health-promoting nutrients. To use sweet potato in smoothies, you just need to cook them first and there are a few ways you can do that. I usually steam sweet potato for use in smoothies but you can also bake them or boil them. I like to peel them, cube them, steam them, let them cool then store in a container in the freezer. Frozen is best for creating the ultimate thick smoothie texture. Another option is to mash cooked sweet potato into ice cube trays, freeze them and then pop them out and into a container for storage. This does make a great option as the sweet potato cubes don’t stick together after freezing, which they sometimes do if you just throw the steamed sweet potato in a container. These silicone ice cube trays are great for making frozen sweet potato cubes. You can use fresh or frozen zucchini in smoothies. I like frozen best for creaminess and texture. I freeze them raw but if you have a hard time digesting raw zucchini, I’d recommend steaming or baking them first. As for the peel, you can leave it on or peel it, it’s up to you. I leave it on and don’t have an issue digesting it once blended. 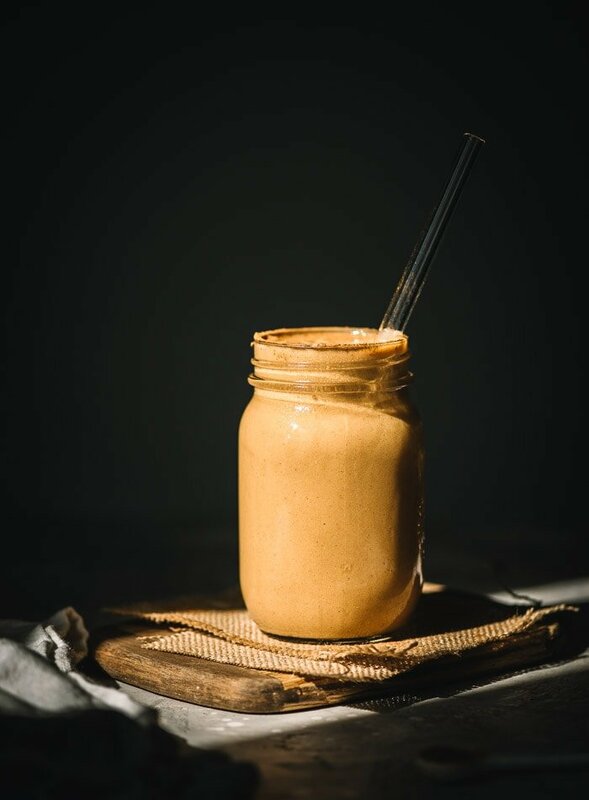 If you have a high-powered blender such as a Vitamix, you’ll have no problem blending them into silky smooth smoothie creations but if your blender isn’t as powerful as you’d like, peeling them might be a good idea so you can get that smooth, creamy texture you’re looking for. The flavour of this smoothie is so addictive and the hearty ingredients make it so filling. I love the creamy mixture into a bowl and topping it with granola. It’s so good! The smoothie is has just a hint of spice and is perfectly sweet thanks to frozen banana and vanilla protein powder. 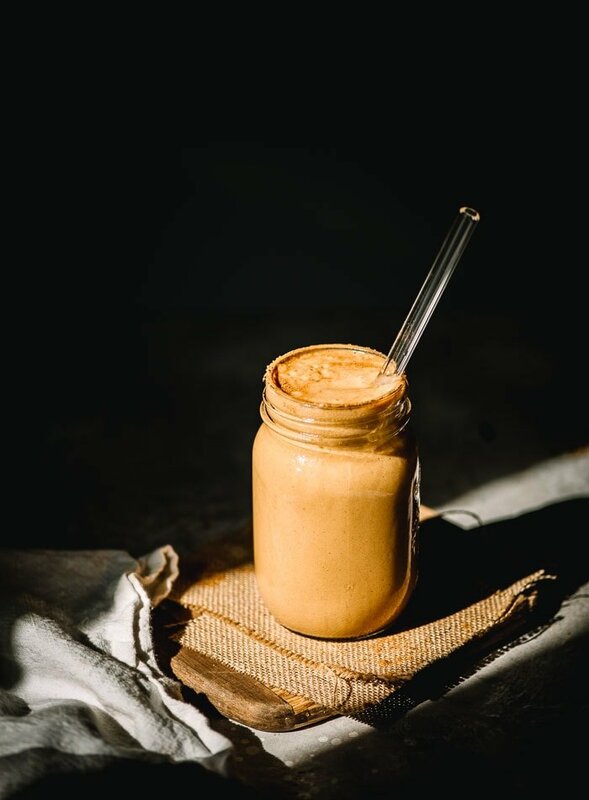 The texture is smooth, rich and creamy with the addition of frozen sweet potato, banana, plant-based milk and almond butter. 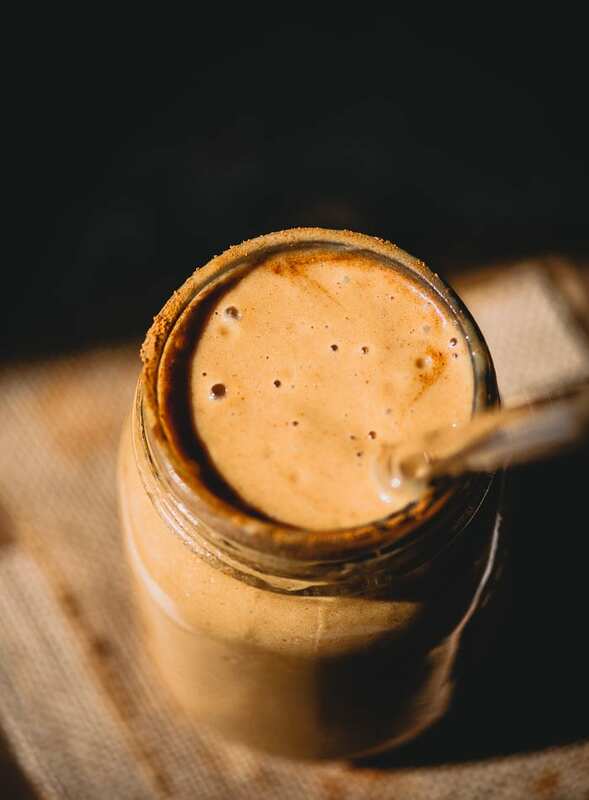 If you add the optional almond butter, 1 serving of this smoothie contains 427 calories with of 51 grams of carbohydrates, 13 grams of fat, 30 grams of protein and 7 grams of dietary fibre. You’ll also be getting 10% of your daily iron, 95% of your daily calcium (if you use store-bought plant-milk), 36% of your daily vitamin C and more than your daily vitamin A. It’s also high in antioxidants, has anti-inflammatory properties and contains a range of other essential vitamins and minerals. Chocolate Banana Smoothie // Strawberry Raspberry Smoothie // Kale Spinach Smoothie // Lemon Blueberry Smoothie // Mixed Berry Smoothie // and so many more. View all smoothie recipes here. This smoothie tastes just like sweet potato pie! It’s healthy, filling, easy to make and so, so delicious you’ll be wanting it every morning. I love drinking this smoothie through a glass straw but it’s even better poured into a bowl, topped with granola and eaten with a spoon. Blend all ingredients until smooth and creamy. 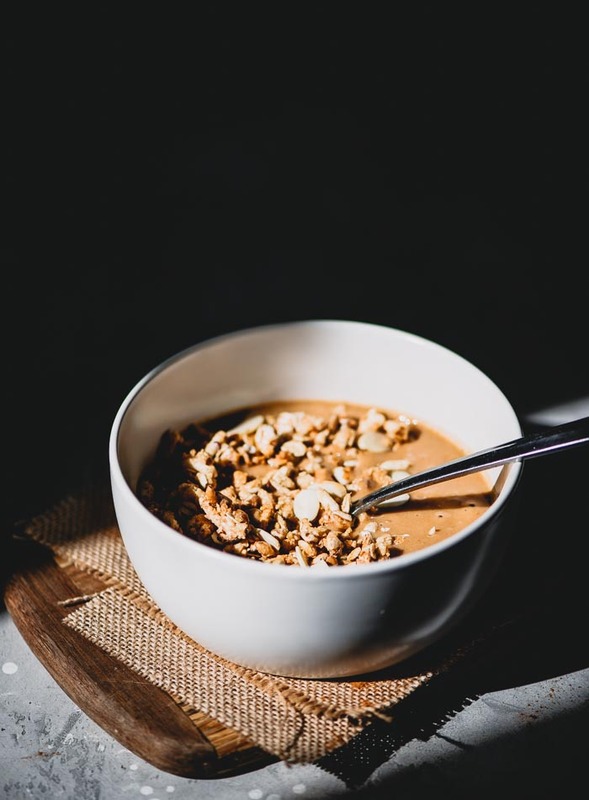 To enjoy as a drinkable smoothie use 1 1/2 cups liquid, for a thicker ice cream-like smoothie bowl, reduce the liquid to 1 cup then slowly add more until you reach your desired texture. Nutrition facts include almond butter, without almond butter it’s 336 calories with 48 C/5 F/27 P.
Wow this sounds so good! If I were to leave out the protein powder, do you think I should make any other adjustments for the flavor? Yes, I would add another sweetener such as dates, pure maple syrup or additional frozen ripe banana and maybe some pure vanilla extract, and you might want to start with a bit less liquid and then add more as needed. I haven’t made it without protein so I’m not sure how the taste and texture will compare but I’m sure it will still be good. Okay nice! Thanks for the advice! I’m sure it’ll still be great. I only have one protein powder right now and I haaaate how it tastes haha, so I don’t want to ruin a smoothie with it. 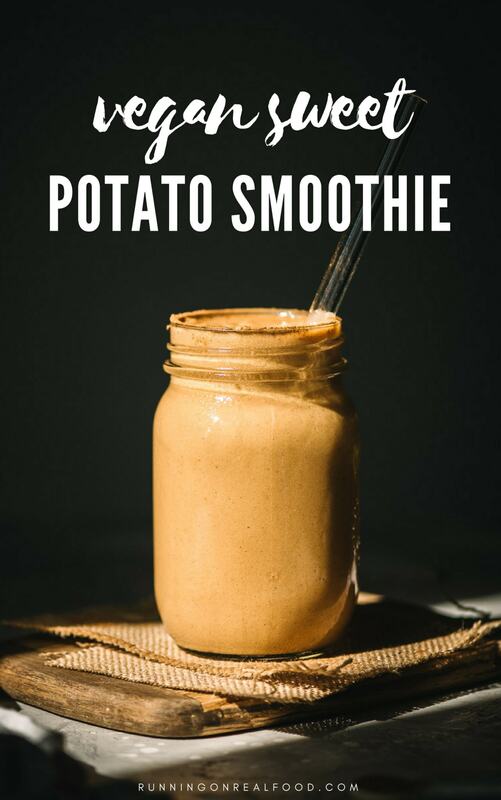 This is the first time I am seeing a smoothie made out of sweet potatoes, it can be a perfect substitute for those protein shakes!